PAUL JAY, SENIOR EDITOR, TRNN: Welcome to The Real News Network. I’m Paul Jay in Washington. On Tuesday, May 24, when Israeli Prime Minister Benjamin Netanyahu spoke to the American Congress, he received no less than 26 standing ovations. Now, we’re not going to show you all 26, but here’s a taste of the atmosphere. The Prime Minister spoke about Hamas. He spoke about peace negotiations. He spoke about Jerusalem. But his fundamental message I took as being there is not going to be any more peace negotiations. You cannot take a position on the issue of refugees, Jerusalem, Hamas, and other issues that are completely beyond any possibility of Palestinian agreement and think there’s going to be peace negotiations. But here’s how the mainstream American news covered all this. Apparently, he was offering a compromise. He said one sentence which went like this. BENJAMIN NETANYAHU, ISRAELI PRIME MINISTER: In any real peace agreement, in any peace agreement that ends the conflict, some settlements will end up beyond Israel’s borders. JAY: Well, when you know everything else you’ve said has essentially torpedoed any possibility of any real negotiations, I’m not sure it’s such a big concession to say, yeah, we know something’s going to be outside ’67 borders, especially when you said we’re really not going back to ’67 borders anyway. 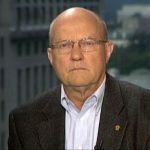 So now joining us to talk about these reception in Congress and the American coverage in the news media of Netanyahu’s speech is Larry Wilkerson. Thanks for joining us, Larry. JAY: And I’m sure everyone knows Larry was Colin Powell’s chief of staff. He now teaches in a couple of universities in Washington and is an expert on national security and foreign policy issues. Thanks. So, first of all, what did you make of the congressional response? It was quite overwhelming. You rarely see this even when the presidents come and give State of the Unions. WILKERSON: Even the obsequiousness of the United States Congress from time to time during States of the Union or other type speeches doesn’t come anywhere near this. I mean, this was a reputation, really, of the standing policy position of the sitting president of the United States by the separate and equal branch of government, the Congress, with a foreign leader being the center pole around which they coalesced this opposition. It’s really quite remarkable. JAY: –it’s a longstanding US position–last George Bush, Clinton. Why does Congress respond this way? WILKERSON: It’s a mystery to me, except money. I mean, that’s the only answer I can come up with. There’s a lot of money involved. And even though there are some congressmen and women out there who are not–we can check–recipients of that money directly, they still understand that a powerful entity in America is the lobby group AIPAC for Israel and that that generates a lot of coin, a lot of money for people who may support positions that they will support and so forth and so on. That has to be one reason. But I think probably a bigger reason, and one we overlook a lot, is this psychological angst that Americans have in general about their failure to respond positively, if you will, in the ’30s when Jews were being harassed by the looming Nazi regime to the point that when we did finally get into finding out about what the Nazis were doing during the war itself, it was quite heinous–I mean, the concentration camps, the deaths of so many Jews and others. And there is some psychological guilt, I think, left over from that, and that guilt sort of excuses Israel when it does things that are not in its own interests, certainly in the United States’ interests, and are against our values and the professed values of Israel itself. We forgive those almost blanket-wise. JAY: And this issue of shared values, to have a state that’s based on an ethnicity or a religion, it should not be considered a shared value with a modern democracy. 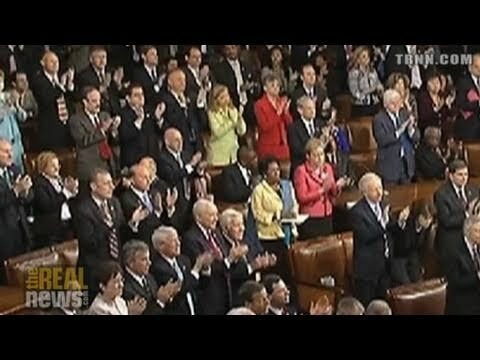 JAY: Yet there they are, applauding. WILKERSON: It’s another one of these things where we make these middle leaps that are tortured. We stand up against UN Security Council resolutions, for example, 184 to 2 or 184 to 3 or whatever, that we shouldn’t be standing up against. We never reprimand Israel. And that’s a recipe for Israel being the spoiled child that Israel has become under Netanyahu and Lieberman and others like them, a spoiled child who can get away with anything, including, for example, the heinous way they responded to the Gaza flotilla a few months ago, when they essentially lost a key strategic partner because of that, Turkey. JAY: In terms of the extent of the exuberant enthusiasm, when you have him saying Jews have a 4,000-year connection with this land and there are some Palestinians that happen to share it with us–I’m throwing in the word happen, but that’s sort of the inference. WILKERSON: I think there’s another aspect of it, too, the irrationality of his statements about the ’67 borders, for example, being indefensible. Well, they’re indefensible because of the settlements. They’re not indefensible per se; they’re indefensible because of all the settlements and because the IDF can’t possibly defend those people from those borders. So the irrational nature of his remarks, too, is incredible. But even more incredible than that is the American people and particularly the national security elite’s buying of these arguments, when most of them know they’re not valid arguments or know that they’re being made for other reasons than the reasons Netanyahu professes. He’s not interested in an agreement. He’s not interested in a peace settlement. He’s interested in the territory. He’s interested in something Henry IV was interested in, something that most modern powers say is passe now: he’s interested in land grabs. And they are involved in one of the biggest land grabs in the region. And that’s it, plain and simple. This administration of Netanyahu does not want peace. JAY: So one of the things that occurs to me about why they’re standing with such, you know, emotion and they’re practically having a competition between Democrats and Republicans who applauds the loudest is they know every moment’s going to be analyzed. It’s all on television. If anyone sits, never mind doesn’t applaud, but imagine sitting with everyone else is applauding, you know, you’re an anti-Semite. And this idea that they’re being accused of not being enthusiastic about Israel is that you’re going to be targeted, that must play a big role in this. WILKERSON: I’m sure it does. You know, as you were describing that, what you remind me of is the vivid scenes in 1933, ’34, and ’35, in Berlin in particular, but all across Germany, when SA stormtroopers would march through the streets, and even an American on the street, when many of these incidents happened, two or three a month, would not render the zieg heil!, the salute, and would turn their backs on the SA troopers and look in a shopping window or whatever, immediately in SA trooper would break out from the formation and confront them and ask them why they weren’t rendering the salute, and oftentimes bludgeoned them on the spot. Our ambassador in Berlin had to go to the Foreign Ministry of Germany all the time and ask them to apologize, ask them to do something in the way of reparations, and so forth. This is the kind of attitude that you just described. JAY: You now remind me of this Mark Twain story about the burning of witches and people from the village all around watching the witch being burnt, and they’re all saying, "Burn her, burn her," and Twain writes, they all know she’s not a witch. But if you’re not shouting "burn her", you’re–. WILKERSON: They might burn you the next. WILKERSON: That’s it. That’s some of it. It’s a strange phenomenon in some ways, but then again, history is replete with examples of it.